Immerse yourself in the tropical splendour of the Maldives and the Seychelles on a 17-day voyage aboard Silver Discoverer. Departing Colombo, Sri Lanka, on 22 December 2017, Silver Discoverer sails to the Maldives, where guests have the opportunity to explore a variety of inhabited islands accompanied by white-sand beaches and clear-turquoise waters. Guests can also marvel at the vibrant palettes of underwater life as they snorkel in the Indian Ocean. Silver Discoverer continues her journey to a variety of islands in the Seychelles, these include: Maheì, an island full of green hills clocked with tangled jungle; La-Digue, known for granite boulders that scatter along the shore; Praslin, home of the Valleìe de Mai, a UNESCO World Heritage site; and Desroches Island, which is protected by its own flourishing coral reef. One of the most unforgettable highlights of the voyage awaits guests in Aldabra, Seychelles, the world's second-largest atoll, virtually untouched by humans. 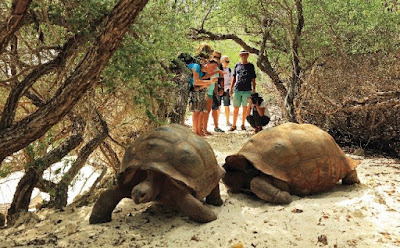 Here, guests have the chance to study and interact with Aldabra's incredible wildlife, including, the Aldabra Giant Tortoise, where two thirds of the world population of this species live. Guests will also have the opportunity to visit the small scientific research station on Picard Island and photograph the mighty tortoises as they roam this isolated Island. This voyage then visits Zanzibar, Tanzania, where guests can visit the UNESCO World Heritage Site, Stone Town, a fine example of a Swahili coastal trading town, before disembarking in Dar es Salaam, Tanzania on 08 January 2018. Prices are per person, starting from AU$15,435* in an Explorer Suite, including Early Booking Bonus, based on double occupancy. Silversea Expeditions' fares include: all shore and Zodiac excursions hosted by an expedition leader; all-suite accommodation with butler service; gourmet meals with menus inspired by Relais & Châteaux; complimentary wines, Champagne and spirits served throughout the ship; an outstanding expedition team of expert guides and lecturers; complimentary WiFi and all gratuities. Early Booking Bonus: Save 10% if you book and pay in full by 28 February 2017. *This voyage is subject to availability and may change or be withdrawn at any time. Terms and conditions apply.